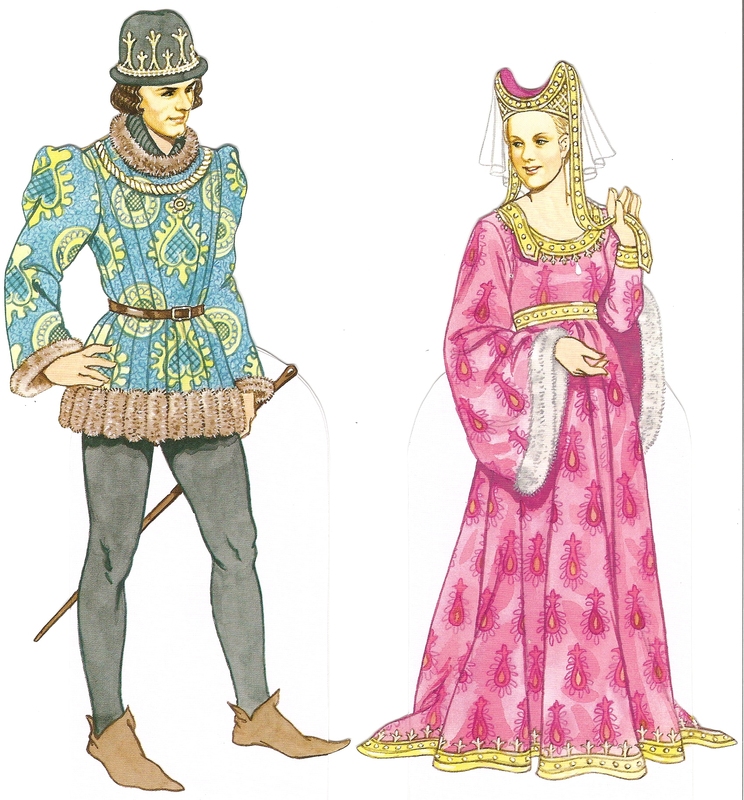 As I promised earlier, I scanned some of the best of the paper dolls to visually show the styles of the nobility/middle class from around 1200-1450 in Western Europe, especially England and France. They are generally shown in chronological order. All of the terms are defined in my previous post. c. 1200 The woman is wearing a black wool surcoat over a pleated chainse, and a porkpie hat over her hair. This style of a loose, vertical gown was frequent in the earlier Medieval period. The man is wearing a particolored cotehardie and a surgarloaf hat, all over his hose and leather shoes. 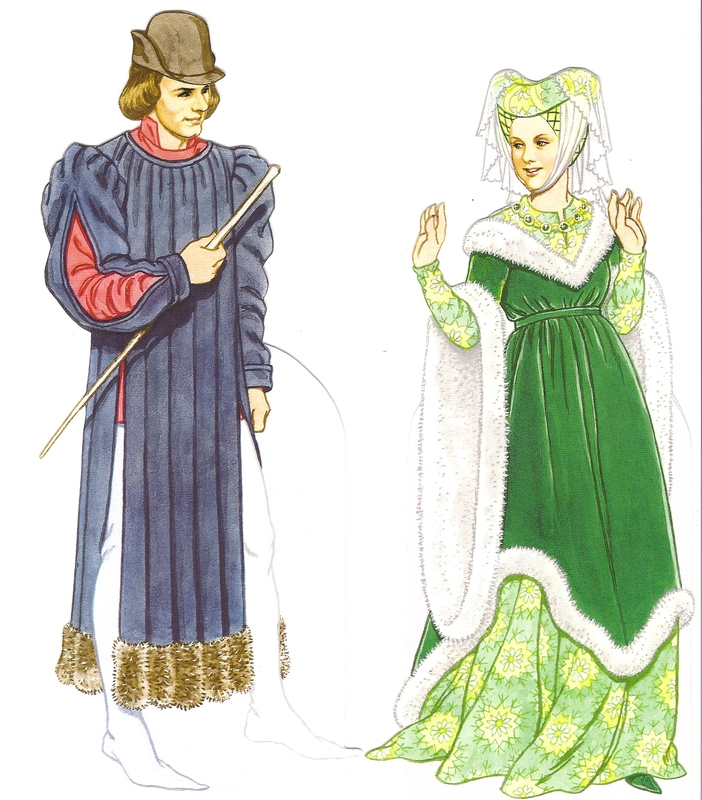 c. 1250 The woman is wearing a pale green cotehardie with a full skirt and sleeves over a maroon chainse. Belts were often worn as in this picture to hold up the skirts and allow for freer movements. Low-waisted belts would remain the fashion until the late fourteenth century. She is also wearing a chatelaine to carry household items. She wears a gorget and wimple over her hair and neck. The man wears a fur houppeland with the leather on the outside and a leather belt with another form of a chatelaine. 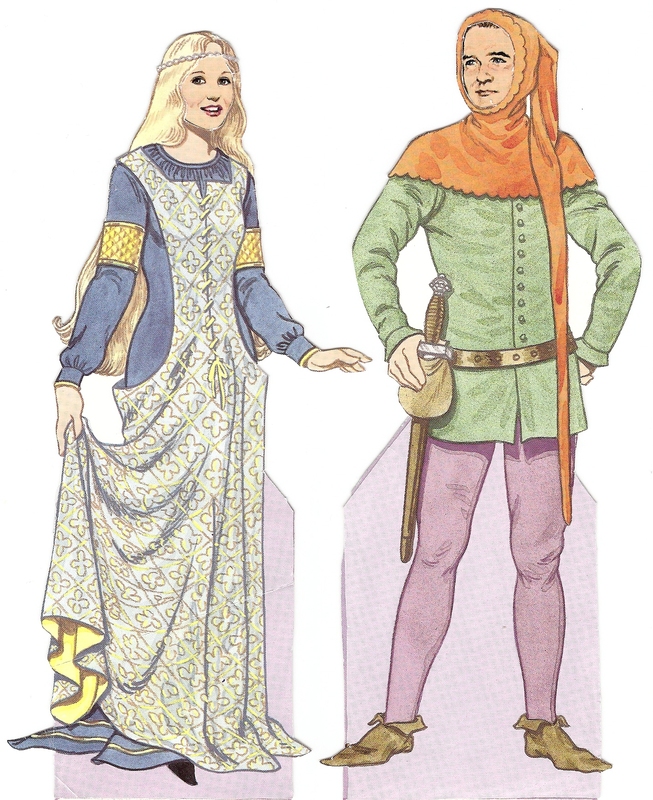 c. 1300 Here the woman is wearing a sideless/cutaway surcoat laced up the front over a blue cotehardie. 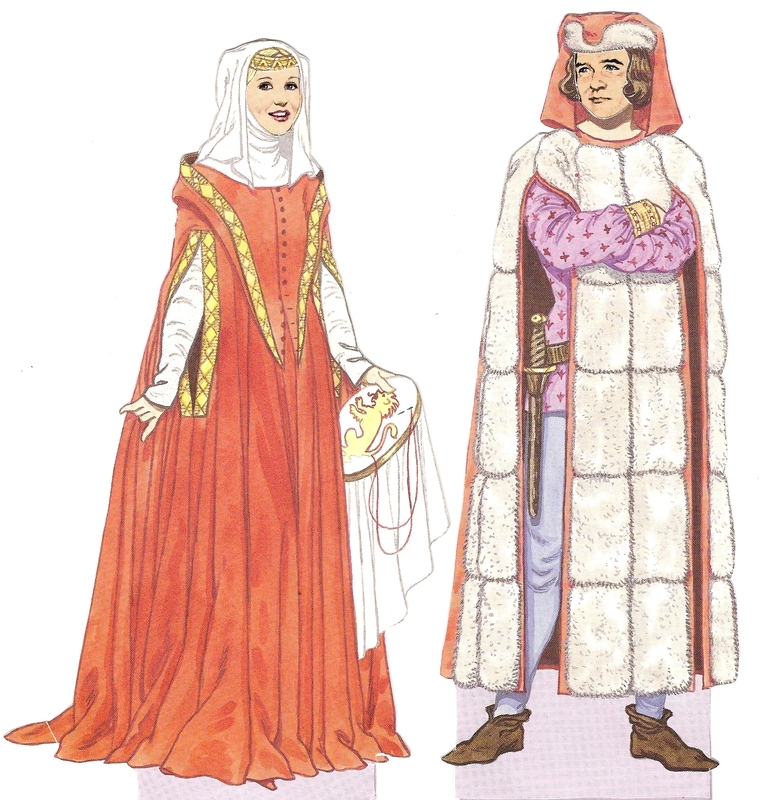 This style of surcoat was looked down on by the church because it accentuated the feminine figure. Her hair is worn loose down her back, usually only acceptable for younger women and girls. The man is wearing a short green cotehardie and an orange chaperon with a long liripipe attached. The points of his shoes are a bit more elongated, and they would continue to get more and more so throughout the period. c. 1350 Here the woman wears a pelicon made from a huge piece of elliptical fabric with slits cuts for the arms and head. A hood is attached to the neck and buttons down the front. She also wears a wimple over her hair. At this point wearing hair loosely and uncovered was considered unacceptable, which eventually gave rise to elaborate headdresses. The man wears a short cotehardie and hose under a tabard faced with fur. His cap is draped with woolen cloth. c. 1350 The man wears a blue tappert with padded shoulders and slashed sleeves. His hose are particolored white and light blue. 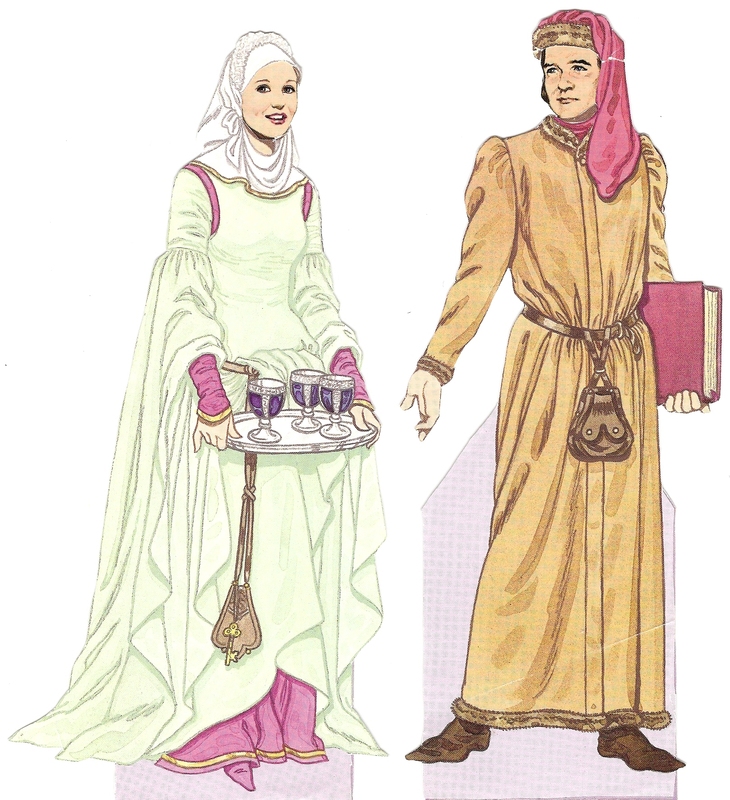 The woman wears a rolled and padded hennin worn over a caul and draped with a veil. Her surcoat is worn over a brocade cotehardie and lined with fur, as are the dalmation sleeves. 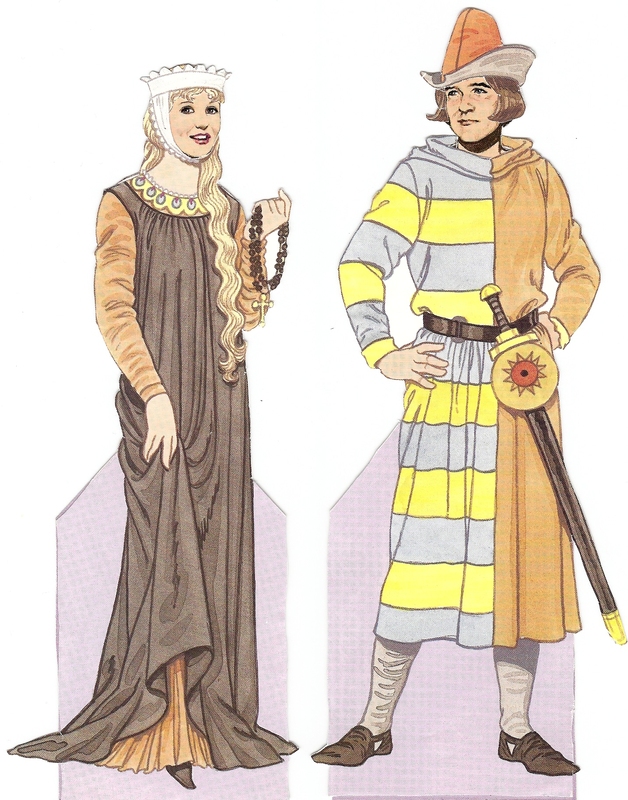 High-waisted gowns became the fashion for the rest of the Medieval period. 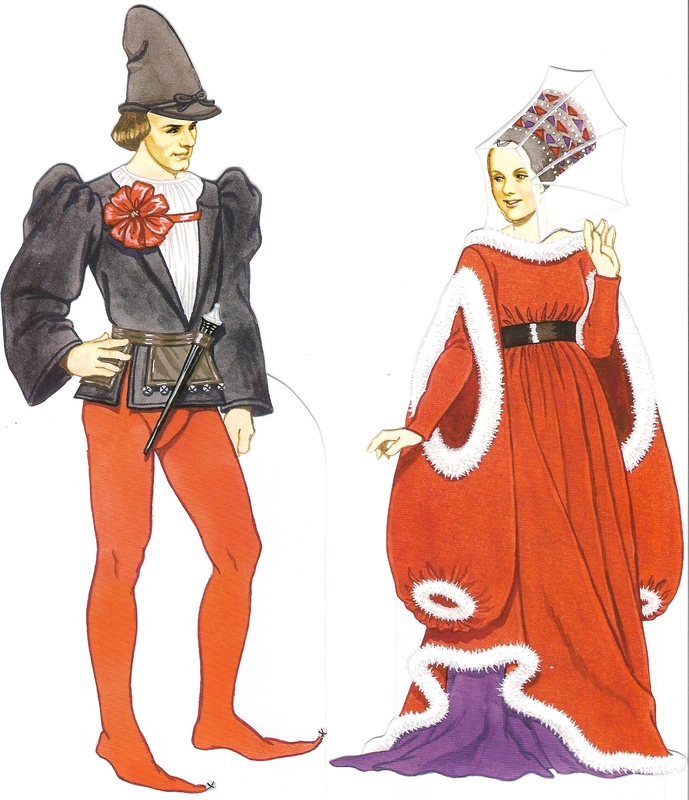 c. 1400 The man wears a red houppeland with dagged dalmation sleeves and a chaperon which is also dagged. The woman wears a dress with a style very popular in this period. The neckline forms a deep V to the waistband, with a ruched bib underneath coming up higher to the neckline. The blue gown is trimmed with red velvet. 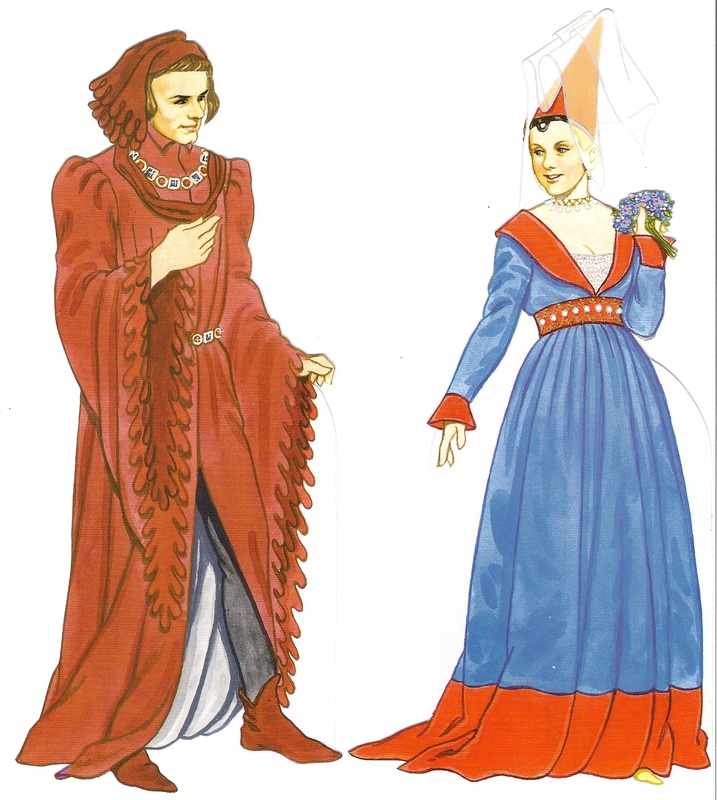 This style of gown was often known as a “Burgundian gown.” She wears a hennin with a butterfly styled veil. c. 1450 The man wears a short pourpoint jacket lined with fur. His hat is trimmed with a gold coronet. The woman wears an escoffion with a veil and gold ribbon attached. Her brocade gown has fur-lined dalmation sleeves. Jewels and gold were often used to line clothing of the nobility as a means to display wealth. c. 1450 The man wears a “shockingly” short tunic that became popular in this period. The feet of his hose are pointed and tipped by bells. Bells were often used on many garments, especially belts, purses, and shoes. The woman wears a gown with bag sleeves trimmed in fur. Her headdress is a more modern version of the toque, worn with a butterfly veil. Excellent descriptions. I am learning more from you everyday! I love these paper dolls! They are pertinent and neat to see. I really wish I can buy those paper dolls one day. By the way, I really appreciate your work about the history of costumes because I’m an aspiring fashion designer and I’m also fond of historical clothes 🙂 Thanks.